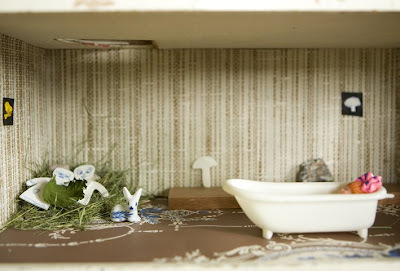 This thrifed dollhouse via fine little day. It's sort of like a giant multi-room diorama. I'm going to ask Bryan to build one for Audrey and me to trick out with little found treasures and wallpaper and fabric scraps as our summer project. Green tea ice cream -- I have to have a bowl every single day. I'm officially addicted. Duet Letterpress... I love her letterpress work + her equally excellent blog, especially the gorgeous pics of her recent Paris vacation. Caris Reid's work (still!) If you're lucky enough to live near Columbus, Ohio be sure to check out her show. Melissa's gorgeous pottery... especially this little egg vase. Oh, that vase is beautiful! That dollhouse rocks! 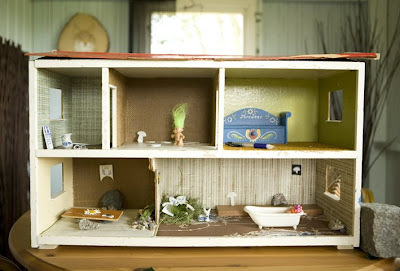 What fun will it be to build and design your own little dollhouse - very cool! 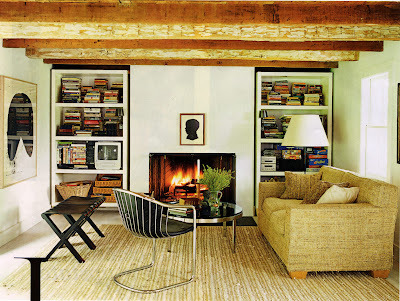 exposed beams and a fireplace! what more could you ask for in an upstate vacation home? That vase is gorgeous! I did check out her etsy site and she has such beautiful items! I love, love, love the first room in your post. It is serene and so well edited. Interesting placements of the art in the room. I had a good laugh at the pic of the doll house with the nest and paper people hanging out with Bambi. Green Tea ice cream. Have you tried it at Tei Tei's on Henderson... pure goodness. Not in a scary shade of green either. Glad for the update on the art show. 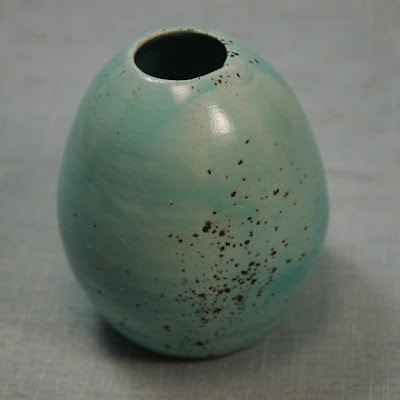 Love the textural simplicity of the egg vase. mb -- i've tried tei tei's ...it's good! we love that place. the dollhouse is a hoot, no? Dollhouses tend to creep me out, but I am spared from that feeling when looking at your dollhouse due to the presence of that green haired toy! Thanks for breaking the spell! Ooo, the vase is so cute! And I totally know what you mean about the green tea ice cream. It is truly one of the most refreshing things to have in the summer. we just got back from japan where green tea ice cream was everywhere! i gave it a try and i think i'll have to try it a few more times before i decide how i feel about it... where do you get yours? kt -- i found mine at a grocery store in Texas called Central Market...you might try whole foods too! I love what you're loving...esp, the pottery and Duet Letterpress. I love that you are addicted to Green Tea Ice Cream. I love the first photo ... how simple but elegant. loving the dollhouse, good luck making it! beautiful finds! thanks for the intros to the artists and blogs!! My little lady wants a doll house for her birthday, so fun. That dollhouse is a nice basic shape so it should be pretty easy to make. I can't wait for my bean to get big enough to be excited about stuff like this! 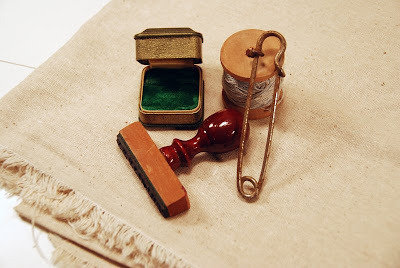 I loved anything tiny when I was a kid (who am I kidding? I still do). good luck! that living room is fabulous! who says minimalist can't be warm? 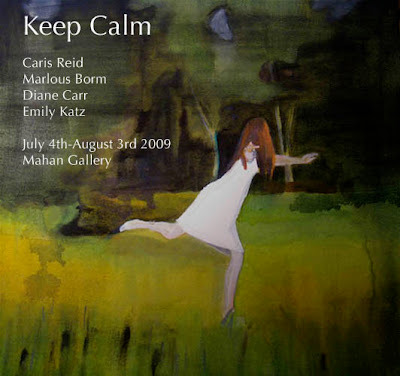 I adore your blog and was so delighted to see the mention of The Mahan gallery! I live in Columbus + Jacquie (the owner) is a good friend of mine!